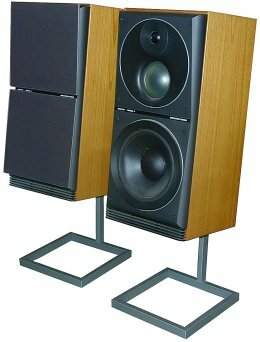 The largest of the last generation S type uniphase speakers, and the only bass reflex model. Construction differed from its lesser brethren by the positioning of a forward facing port at the base of the speaker with a rather flimsy series of plastic strips covering the opening. Inside the passage to this port was formed by the positioning of a dividing strip of wood with an opening across the rear of the cabinet. A similar pattern to the other S type speakers of this era was followed otherwise with the 2.5cm tweeter and 7.5cm SEAS dome phase link unit being fitted in a resin chamber at the top of the speaker and a high quality Peerless 20.5cm woofer being fitted below. A single 2 pin plug was recessed in the wood veneered back of the cabinet. Provision was made for the fitting of a floor stand. Beovox S 120 was replaced by Beovox MC 120.2 which, apart from the fitting of wiring posts in addition to the DIN plug, was much the same. Text copyright © Beocentral. Unauthorised reproduction prohibited.